A chase involving Santa Clara County sheriff’s deputies early Wednesday ended in a crash and three arrests on a busy San Jose street. Kris Sanchez reports. A chase involving Santa Clara County sheriff’s deputies early Wednesday ended in a crash and four teenagers being taken into custody in San Jose. Deputies tried to stop a speeding 90s Honda Accord around 1:30 a.m., but its driver hit the gas and fled. 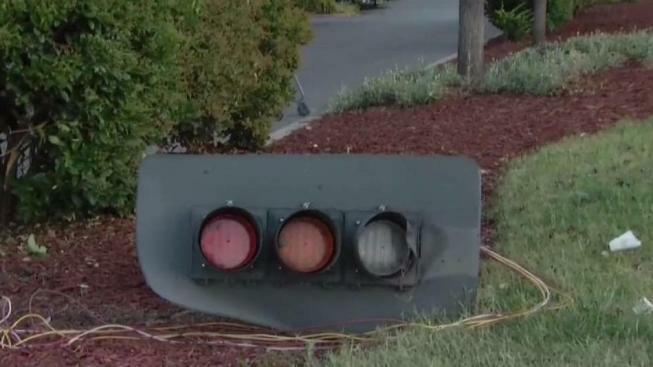 The driver also ran a red light, but was forced to swerve to avoid hitting a large dog, according to the Santa Clara County Sheriff's Office. The pursuit ended by the Highway 101 and Interstate 680 interchange, near the Happy Hollow Park and Zoo, when the driver collided with a traffic light pole on Story Road. The vehicle was then propelled through bushes before it came to rest nearly 50 feet away after slamming into a car in a Walmart parking lot, just east of Roberts Avenue. “They spun out of control and then they swerved and they did three flips and they crashed into the parking lot of Walmart," said Carolina Solorio, who watched the entire scene unfold from the window of a nearby drive-thru where she works. Solorio thought she said, “Oh my god!” to herself, but “I actually screamed it out loud.” The customer she was serving at the time was equally shocked by the crash, she said. "They were going pretty fast because they were out of control," Solorio recalled. "They hit a couple things." Four juveniles jumped out of the car and scattered, in an effort to run away. However, they were detained by deputies. The three boys and one girl ranged from 13 to 17 years old, deputies said. "They got out (of the car) and actually ran. I couldn’t believe that they could run after that!" Solorio said. The teenagers were treated at a hospital, cited and released to their parents. The car they were driving was stolen, deputies discovered. The foursome could face charges for stealing the car and felony evasion, but the matter will be handled through the juvenile court system, according to the sheriff's office. At the scene, a traffic pole, which was sheared off at the base, lies in pieces while skid marks show the car’s trajectory before the crash.